This is what you call a dark Americana horror, a unique dark fantasy, a twist on the idea of the supernatural. An idea of witchcraft type of story, mixed with folk lore. A preacher named Will and his flock of followers are considered outcast. Will is accused of witchcraft and the town of Dalton tries to hang him, but Leah, a follower with powers, chants, making the rope brake, and so Will, takes his followers and adventures off to find there own settlement. Will is a ladies man, having relations with many women, supplying and building his flock. Leah is able to use interesting powers to help them. She is able to move objects. Her past is that the town folk dragged her mother out and burned her alive. Will took her in and saved her. Tragically this is an overlooked film. The script is a wonderfully written fantasy story of classic Americana set in the 1700's. This is an interesting mix of mysticism along with the aspects of horror, which is twisted around the setting of a western style film. Now Will and his followers come across an ancient Indian land and forest full of secrets, full of Indian, legends and folklore. Leah's supernatural means, senses the forest, senses the presence of something great, something horrifying, something deep and dark, something that is slowly making itself known. We have a very spooky Gothic horror story that bleeds an aspect of history, and also the underlining aspect of legends that come to life in a reality setting, that haunts the viewer. This is a great folktale, a low-budget classic that should get a proper DVD or Blu-ray special release, hopefully some day. This would be considered into day's standard, an independent film. This is an atmospheric, haunting, cultural, historical, underlining of the supernatural, ghost, demons, it plays on the lines of good and evil. Truly a profoundly disturbing film. A film that you won't forget, a film that plays on your mind long after it's over. Soon, Will decides to make the land his own by creating a garden, by placing a holy cross upon the land, by christening the land a religious settlement of his God. It's an intriguing, weird, unique folk, Gothic type of Americana tale woven around Indians, ghost, supernatural, demons and the idea of the devil living in the trees. I find this very creepy. This was written and directed by independent filmmaker Avery Crounse. It was brought out in theaters by Elysian Pictures. In 1987 it was brought out on Vestron Incorporated VHS. Sadly this has not gotten an official DVD release in America as of this writing, and can only be bought on VHS or bootlegged or VHS transfer on DVD. 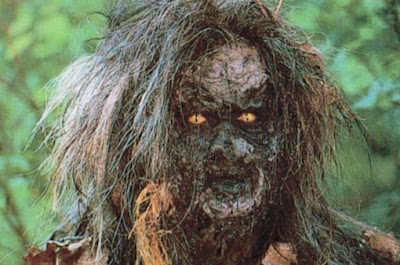 I really find this an old classic from the 80's that really sustains the creepy feel of darkness, and the twisted reality of old camp fire ghost stories. Sadly, Avery Crounse only directed three films. 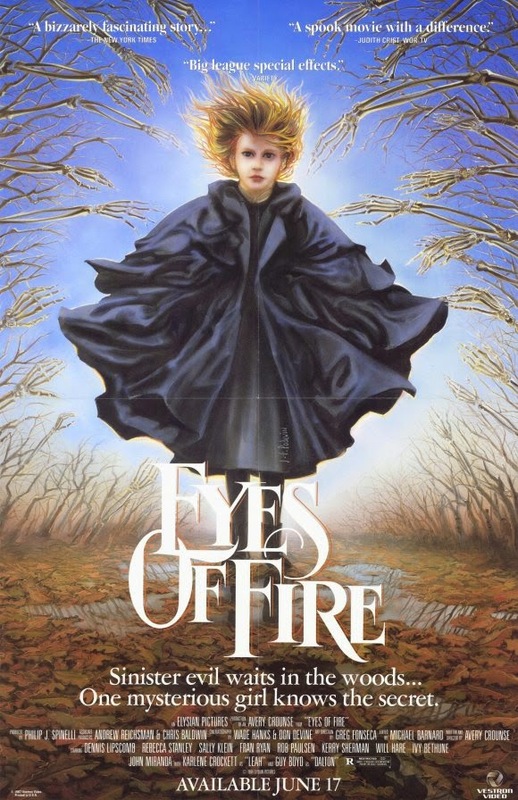 1983’s Eyes of Fire. 1988’s The Invisible Kid and 1996’s Sister Island. He also wrote all three of this film. His last film was in 1996. It’s a true shame that he has not created more. He truly had away with telling a story. He can capture a brilliant reality. Eyes of Fire I feel is his stark, unflinching perfection. In his last film to date his daughter Erin Buchanan starred and which she also won Best Actress award at the Giffoni International Film Festival which the film also won Best Picture. His daughter Erin Buchanan was also in Eyes of Fire playing the part of Meg. I think what makes Avery stand out is he has his hands in everything to create his films, from editor, producer, writer and director. I think Avery is fine example of a very underrated director. It’s a true shame he has not directed more feature films. Eyes of Fire is a film that truly stands out above and beyond many.